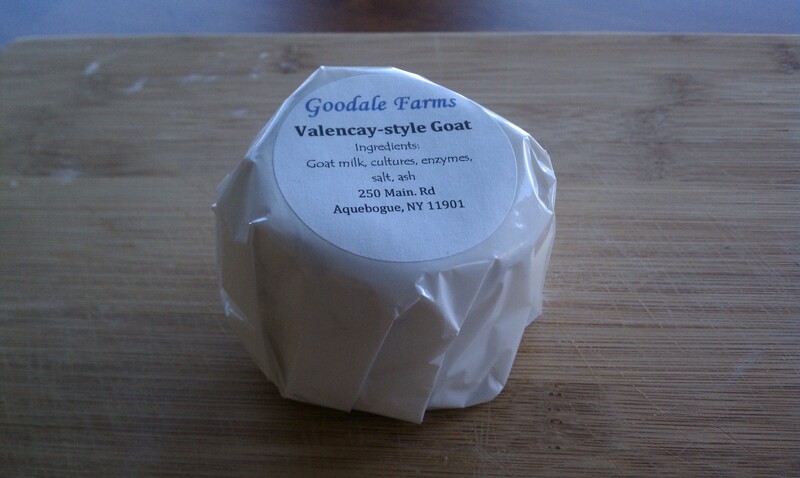 There is a new cheesemaker out on Long Island that I have read about for the past year. Goodale Farms has generated quite a bit of buzz in the local community of Aquebogue, NY, due to the awards that they won at the American Dairy Goat Association’s 2011 national convention. I haven’t had a chance to visit the farm as of yet, but I was finally able to get my hands on some of their cheese from the Village Cheese Shop out in Mattituck, NY. Goodale Farms in Aquebogue places a strong emphasis on milk quality and the natural farming practices required to support it. They don’t use pesticides and the fertilizer is primarily made of compost mixed with manure from their own animals. Practices such as this are incredibly demanding, but the results outweigh the effort for most who are dedicated to sustainable farming. In addition to award-winning cheese, the farm also sells a variety of products from their land such as fruit, vegetables, and other dairy products. I just bought 2 of their cheeses and they are amazing!